BOLT008: Fading From Here e.p. J.Auer's first EP release on Boltfish Recordings. 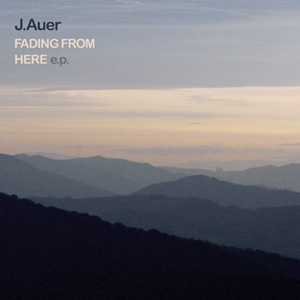 "a laptop, a power supply, some software, some electricity and my emotions"
""Fading From Here" is the name of an excellent EP by J.Auer on Boltfish Recordings displaying 4 minimal drum machine based tracks. For the simplicity of things they’ve been entitled numerically and in order. The four tracks "i", "ii", "vii" and "x" making the MP3 release all have steady drum machine programming basslines and nice sounds. The CDR release contains not one, but 6 bonus tracks! And they all manage to reach the high standard of the previously mentioned 4 tracks. ""Fading from here" ep, lit up my sleepy eyes and brain on the dull sunday morning I reviewed it. Full of texture and character, blended with dark electronic arcade style memories, this one is another notch on the robotic belly for Boltfish and J.Auer. Keep em coming lads. "Japan resident Joseph Auer uses a laptop, a power supply, some software, some electricity and emotions to create his sonic sound-escapes. On Fading From Here, propulsive analog basslines punch through the monitors as chiseled beats fracture the foundations of atypical electronics. "VIII" is a classic example of this formula - rugged downtempo rhythms fluctuate against dense beats. While most of Fading From Here encapsulates the beat-infested sounds of exp-electronics, some of the ideas on this EP seem to rust away without causing much of an effect. The analog feel of this album is a radioactive conglomeration of piercing effects that might line up well with fans of Spark (n5MD) and Linenoise (Lacedmilk). A plethora of percussive elements clash against fragments of melodic ambience without veering too far into generic equations of electro. Often dark and brooding, Fading From Here features well executed beat programming tied to loosely crafted analogous bass. And although consistency seems to be the governing factor on this 10-track "EP," it might have been more amusing to allow these musical concepts to flourish even further with the abundance of quality beat juggling." "‘i’ opens the EP with electro industrial beats and high octane twisted chords. There’s an edge to track that’s somewhere in between scary and hypnotising. And so it is that the whole EP takes a journey through dark industrial landscapes." "...there’s many a basement club will be cranking up the volume for their regulars with this EP. Dark and hard electronica.."
Buy this release digitally, direct from the Boltfish Recordings. Digital handling and payments via Bandcamp/Paypal.